John Zachary DeLorean (January 6, 1925 – March 19, 2005) was an American engineer, inventor and executive in the U.S. automobile industry, widely known for his work at General Motors and as founder of the DeLorean Motor Company. DeLorean managed development of a number of vehicles throughout his career, including the Pontiac GTO muscle car, the Pontiac Firebird, Pontiac Grand Prix, Chevrolet Cosworth Vega, and the DeLorean sports car, which was later featured (in modified form) in the 1985 film Back to the Future. While still the youngest division head in General Motors history, DeLorean broke away to start his own DeLorean Motor Company (DMC), in 1973. However, production delays meant DMC's first car and DeLorean's independent creative opus—the DeLorean did not reach the consumer market until 1981 (8 years later), where a depressed buying market was compounded by unexpectedly lukewarm reviews from critics and the public. After a year, the DeLorean had failed to recoup its US$175 million in investment costs, unsold cars were accumulating, and the company was in dire financial straits. John Zachary DeLorean was born on January 6, 1925 in Detroit, Michigan, the eldest of four sons of Zachary and Kathryn (née Pribak) DeLorean (originally named Delureanu, a common Romanian name, DeLorean being an anglicisation). DeLorean's father was Romanian, born in Șugag village, Alba County, Austria-Hungary present day Romania, who worked in a mill factory; Zachary emigrated to the United States when he was twenty. He spent time in Montana and Gary, Indiana before moving to Michigan. By the time John was born, Zachary had found employment as a union organizer at the Ford Motor Company factory in nearby Highland Park. His poor English skills and lack of education prevented him from higher-paid work. When not required at Ford, he occasionally worked as a carpenter. DeLorean's mother was a fellow Austria-Hungary citizen of Hungarian origin. She was employed at the Carboloy Products Division of General Electric throughout much of DeLorean's early life. She took work where ever she could to supplement the family's income. She generally tolerated her husband's erratic behavior, but during several of the worst times of Zachary's violent tendencies, she took her sons to live with her sister in Los Angeles, California, where they stayed for a year or so at a time. DeLorean's parents divorced in 1942. John subsequently saw little of his father, who moved into a boarding house, becoming a solitary and estranged drug addict. DeLorean attended Detroit's public grade schools, and was then accepted into Cass Technical High School, a technical high school for Detroit's honor students, where he signed up for the electrical curriculum. DeLorean found the Cass experience exhilarating and he excelled at his studies. His academic record and musical talents earned him a scholarship at Lawrence Institute of Technology (now known as Lawrence Technological University), a small college located in Highland Park (now located in Southfield), Michigan, a suburb of Detroit, that was the alma mater of some of the automobile industry's best engineers. At Lawrence, he excelled in the study of industrial engineering, and was elected to the school's honor society. World War II interrupted his studies. In 1943, DeLorean was drafted for military service and served three years in the U.S. Army and received an honorable discharge. He returned to Detroit to find his mother and siblings in economic difficulty. He worked as a draftsman for the Public Lighting Commission for a year and a half to improve his family's financial status, then returned to Lawrence to finish his degree. While back in college, he worked part-time at Chrysler and at a local body shop, foreshadowing his later contributions to the automotive industry. DeLorean graduated in 1948 with a Bachelor of Science degree in Industrial Engineering. Instead of immediately entering the engineering workforce after earning his degree, DeLorean sold life insurance. He developed an analytical system aimed at engineers and sold "about $850,000 worth of policies in ten months". But he found the work boring and moved on to work for the Factory Equipment Corporation. DeLorean states in his autobiography that he sold life insurance to improve his communications skills. Both endeavors were successful financially, but these areas held little interest for DeLorean. A foreman at Chrysler's engineering garage recommended that DeLorean apply for work at Chrysler and DeLorean agreed. Chrysler ran a post-graduate educational facility named the Chrysler Institute of Engineering, which allowed DeLorean to advance his education while gaining real-world experience in automotive engineering. He briefly attended the Detroit College of Law, but did not graduate. In 1952, DeLorean graduated from the Chrysler Institute with a master's degree in Automotive Engineering and joined Chrysler's engineering team. DeLorean attended night classes at the University of Michigan's Ross School of Business to earn credits for his MBA degree, which he completed in 1957. DeLorean's time at Chrysler lasted less than a year, ending in 1953 when he was offered a salary of US$14,000 (equivalent to US$131,102 in 2018) at Packard Motor Company under the supervision of noted engineer Forest McFarland. DeLorean quickly gained the attention of his new employer with an improvement to the Ultramatic automatic transmission, giving it an improved torque converter and dual drive ranges; it was launched as the "Twin-Ultramatic". Packard was experiencing financial difficulties when DeLorean joined, because of the changing post-World War II automotive market. While Ford, General Motors, and Chrysler had begun producing affordable mainstream products designed to cater to the rising postwar middle class, Packard clung to their pre-World War II era notions of high-end, precisely engineered luxury cars. This exclusive philosophy was to take its toll on profitability. However, it proved to have a positive effect on DeLorean's attention to engineering detail, and after four years at Packard he became McFarland's successor as head of research and development. While still a profitable company, Packard suffered alongside other independents as it struggled to compete when Ford and General Motors engaged in a price war. James Nance, president of Packard, decided to merge the company with Studebaker Corporation in 1954. A subsequent proposed merger with American Motors Corporation never passed the discussion phase. DeLorean considered keeping his job and moving to Studebaker headquarters in South Bend, Indiana, when he received a call from Oliver K. Kelley, vice president of engineering at General Motors, a man whom DeLorean greatly admired. Kelley called to offer DeLorean his choice of a job in any of five divisions of GM. In 1956, DeLorean accepted a salary offer of US$16,000 (equivalent to US$147,447 in 2018) with a bonus program, choosing to work at GM's Pontiac division as an assistant to chief engineer Pete Estes and general manager Semon "Bunkie" Knudsen. Knudsen was the son of the former president of GM, William Knudsen, who was called away from his post to head the war mobilization production effort at the request of President Roosevelt. Knudsen was also an MIT engineering graduate, and at 42 he was the youngest man to head a division of GM. DeLorean and Knudsen quickly became close friends, and DeLorean eventually cited Knudsen as a major influence and mentor. DeLorean's years of engineering at Pontiac were highly successful, producing dozens of patented innovations for the company, and in 1961 he was promoted to the position of division chief engineer. DeLorean's best-known contribution to Pontiac was the Pontiac GTO, widely considered the first muscle car. DeLorean's most notable contribution to Pontiac was the Pontiac GTO (Gran Turismo Omologato), a muscle car named after the Ferrari 250 GTO. It evolved because of the internal GM ban on racing (January 1963) that ended the methodology which Pontiac had used to propel itself into the # 3 sales slot. Pontiac was forced to take its efforts off the track and put it on the street to maintain its # 3 position. The result was the GTO. 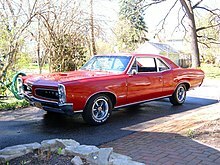 The GTO debuted as a Tempest/LeMans option package with a larger, more powerful engine in 1964. This marked the beginning of Pontiac's renaissance as GM's performance division instead of its previous position as a slightly bigger Chevrolet with no clear brand identity. From its launch in 1964, sales of the car and its popularity continued to grow dramatically in the following years. DeLorean received almost total credit for the success of the "first muscle car", singularly responsible for conceptualizing, engineering, and the marketing – becoming the singular golden boy of Pontiac, and was rewarded with his 1965 promotion to head the entire Pontiac division. At the age of 40, DeLorean had broken the record for youngest division head at GM, and was determined to continue his string of successes. Adapting to the frustrations that he perceived in the executive offices was, however, a difficult transition for him. DeLorean believed there was an undue amount of infighting at GM between divisional heads, and several of Pontiac's advertising campaign themes met with internal resistance, such as the "Tiger" campaign used to promote the GTO and other Pontiac models in 1965 and 1966. One of the biggest disappointments for Pontiac was the GM's fourteenth floor's Ed Cole's decision to ban multiple carburetion. Multiple carburetion had been with Pontiac since 1956 starting with 2X4 bbls. and Pontiac's famous Tri-Power (3X2 bbls.) since 1957. Ironically, the only GM cars to escape this ban were Cole's beloved Corvair and Corvette. There are scores with him in this conflict that go way back to Bunkie Knudsen. The most memorable was that the 1964 GTO was supposed to be equipped with disc brakes, which were even tooled for free by Kelsey Hayes. Radial tires were supposed to be offered, but were killed by Cole, as well. In response to the "pony car" market dominated by the wildly successful Ford Mustang, DeLorean turned to the 14th Floor for permission to offer a smaller version of the Pontiac Banshee show car for 1966. DeLorean's version was rejected because of GM's concern that his design would take away sales from the Corvette, their flagship performance vehicle, so instead they forced him to work with the existing Camaro design. He could only make changes to the front and rear of the car and even had to use the same fenders. Suspension was a whole different story, as the Firebird has different front and rear suspensions than the Camaro. The vehicle, the Pontiac Firebird, introduced for the 1967 model year, became even more popular throughout the 1970s. Shortly after the Firebird's introduction, DeLorean turned his attention to development of an all-new Grand Prix, the division's personal luxury car based on the full-sized Pontiac line since 1962. Sales were sagging by this time however, but the 1969 model would have its own distinct body shell with drivetrain and chassis components from the intermediate-sized Pontiac A-body (Tempest, LeMans, GTO). DeLorean knew Pontiac Division couldn't finance the new car alone so he went to his former boss Pete Estes and asked to share the cost of development with Pontiac, having a one-year exclusivity before Chevrolet would release the 1970 Monte Carlo. The deal was done. The 1969 Pontiac Grand Prix looked a lot like a slightly scaled down Cadillac Eldorado with its razor-sharp bodylines and a 6-foot-long (1.8 m) hood. Inside was a sporty and luxurious interior highlighted by a wraparound cockpit-style instrument panel, bucket seats, and center console. The new model offered a sportier, high performance, somewhat smaller, and lower-priced alternative to the other personal luxury cars then on the market such as the Ford Thunderbird, Buick Riviera, Lincoln Continental Mark III, and Oldsmobile Toronado. The 1969 Grand Prix production ended up at over 112,000 units; far higher than the 32,000 1968 Grand Prix units built from the full-sized Pontiac body. During his time at Pontiac, DeLorean had begun to enjoy the freedom and celebrity that came with his position, and spent a good deal of his time traveling to locations around the world to support promotional events. His frequent public appearances helped to solidify his image as a "rebel" corporate businessman with his trendy dress style and casual banter. Even as General Motors experienced revenue declines, Pontiac remained highly profitable under DeLorean, and despite his growing reputation as a corporate maverick, on February 15, 1969 he was again promoted. This time it was to head up the prestigious Chevrolet division, General Motors' flagship marque. The 1970 Chevrolet Nova was released behind schedule under DeLorean's leadership of GM's Chevrolet division. By this time, DeLorean earned an annual salary of US$200,000 (equivalent to US$1,366,425 in 2018), with yearly bonuses of up to US$400,000 (equivalent to US$2,732,849 in 2018). He had made sizable investments in the San Diego Chargers and the New York Yankees sports teams, and was becoming ever more ubiquitous in popular culture. At a time when business executives were typically conservative, low-key individuals in three-piece suits, DeLorean wore long sideburns and unbuttoned shirts. He also horrified fellow GM executives by inviting Ford president Lee Iacocca to serve as best man at his second wedding. DeLorean continued his jet-setting lifestyle, and was often seen hanging out in business and entertainment celebrity circles. He became friends with James T. Aubrey, president of Metro-Goldwyn-Mayer Studios, and was introduced to celebrities such as financier Kirk Kerkorian, Chris-Craft chairman Herb Siegel, entertainer Sammy Davis Jr., and The Tonight Show host Johnny Carson. The executive offices of General Motors headquarters continued to clash with DeLorean's nonconformity, and he was still not able to fit the traditional mold of conservatism that was usually expected of someone of his stature. When he was appointed, Chevrolet was having financial and organizational troubles, and GM president Ed Cole needed a first-class manager in that position to sort things out – company man or not. The new model Camaro was due out for the 1970 model year, and it was rapidly falling behind schedule. Redesigns for the Corvette and Nova were also delayed, and unit sales had still not recovered from the past four years of turmoil, much of that because of the bad publicity surrounding the Corvair and well-publicized quality-control issues affecting other Chevy models, including defective motor mounts that led to an unprecedented recall of 6.7 million Chevrolets built between 1965 and 1969. DeLorean responded to the production problems by delaying the release of the Camaro, and simplifying the modifications to the Corvette and Nova. He used the extra time to streamline Chevrolet's production overhead and reduce assembly costs. By 1971, Chevrolet was experiencing record sales in excess of 3 million vehicles, and his division alone was nearly matching that of the entire Ford Motor Company. 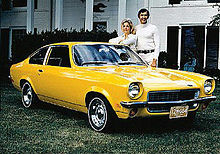 The Vega was assigned to Chevrolet by corporate management, specifically by GM president Ed Cole, just weeks before DeLorean's 1969 arrival as Chevrolet division's general manager. In a Motor Trend interview in August, 1970 DeLorean said, "Vega will be the highest quality product ever built by Chevrolet." By DeLorean's orders, dozens of extra inspectors were assigned to the Vega assembly line and the first two thousand cars were road tested. He stated, "The first cars, from a manufacturing standpoint, were well built." But in 1972, General Motors Assembly Division (GMAD) took over the Chevrolet Lordstown assembly plant and adjoining Fisher body plant. Their main goal was to cut costs and more than 800 workers were laid off, many of which were additional inspectors. This led to assembly-line vandalism, with workers intentionally slowing the line, leaving off parts and installing others improperly. Incomplete and often non-functioning cars soon filled the factory lot, which then had to be reprocessed and repaired by a team assigned to this task by DeLorean. A one-month strike followed, and dealers didn't receive enough cars for the demand in 1972. DeLorean regrouped for the 1973 model year with Vega sales of 395,792. The one millionth Vega was built in May 1973, a month after DeLorean's GM resignation. In 1972, DeLorean was appointed to the position of vice president of car and truck production for the entire General Motors line, and his eventual rise to president seemed inevitable. However, the idea of him assuming that position was almost intolerable to GM executives, and on April 2, 1973, he announced that he was leaving the company, telling the press, "I want to do things in the social area. I have to do them, and unfortunately the nature of our business just didn't permit me to do as much as I wanted." However, it had been rumored that he had been fired. GM gave him a Florida Cadillac franchise as a retirement gift, and DeLorean took over the presidency of The National Alliance of Businessmen, a charitable organization with the mission of employing Americans in need, founded by Lyndon Johnson and Henry Ford II. GM was a major contributor to the group, and agreed to continue his salary while he remained president of NAB. "There's no forward response at General Motors to what the public wants today...A car should make people's eyes light up when they step into the showroom. Rebates are merely a way of convincing customers to buy bland cars they're not interested in." DeLorean left General Motors in 1973 to form his own company, the DeLorean Motor Company. A two-seat sports car prototype was shown in the mid-1970s called the DeLorean Safety Vehicle (DSV), with its bodyshell designed by Italdesign's Giorgetto Giugiaro. The car entered into production as the DeLorean. The car's body distinctively used stainless steel and featured gull-wing doors. It was powered by the "Douvrin" V6 engine developed by Peugeot, Renault, and Volvo (known as the PRV). The manufacturing plant to build the new car was built in Dunmurry, Northern Ireland, with substantial financial incentives from the Northern Ireland Development Agency of around £100 million. Renault was contracted to build the factory, which employed over 2,000 workers at its peak production. The engine was made by Renault, while Lotus designed the chassis and bodywork details. The Dunmurry factory eventually turned out around 9,000 cars during 21 months of operation. Production delays meant the DeLorean did not reach the consumer market until January 1981 (nearly a decade after the company was founded), and in the interim the new car market had slumped considerably due to the 1980 US economic recession. This was compounded by unexpectedly lukewarm reviews from critics and the public, who generally felt the uniqueness of the DeLorean's styling did not compensate for the higher price and lower horsepower relative to other sport coupes on the market. While interest in the DeLorean quickly dwindled, competing models with lower price tags and more powerful engines (such as the Chevrolet Corvette) sold in record numbers during 1980-81 in spite of the ongoing recession. By February 1982, more than half of the roughly 7,000 DeLoreans produced remained unsold, DMC was US$175 million in debt, and the Dunmurry factory was placed in receivership. After going into receivership in February 1982, DMC produced another 2,000 cars until John DeLorean's arrest in late October, at which point liquidation proceedings were undertaken and the factory was seized by the British government for good. After DeLorean left General Motors, Patrick Wright, author and former Business Week reporter, approached him with the idea of writing a book based on his experiences there. DeLorean agreed to dictate his recollections for Wright, who wrote the book. The final product, published in 1979, On a Clear Day You Can See General Motors, sold approximately 1.6 million copies, but disagreements over the content led to a conflict between the collaborators, with Wright eventually publishing the book on his own. On October 19, 1982, DeLorean was charged by the US government with trafficking cocaine following a videotaped sting operation in which he was recorded by undercover federal agents agreeing to bankroll a cocaine smuggling operation. The FBI set him up with more than 59 lb (27 kg) of cocaine (worth about US$6.5 million) in a hotel near Los Angeles International Airport after arriving from New York, and the Federal Bureau of Investigation stated DeLorean was the "financier" to help the financially declining company in a scheme to sell 220 lb (100 kg), with an estimated value of US$24 million. The government was tipped off to DeLorean by confidential informant James Timothy Hoffman, a former neighbor, who reported to his FBI superiors that DeLorean had approached him to ask about setting up a cocaine deal; in reality, Hoffman had called DeLorean and suggested the deal (which DeLorean then accepted) as part of Hoffman's efforts to receive a reduced sentence for a 1981 federal cocaine trafficking charge on which he was awaiting trial. Hoffman (whose name was redacted on the original indictment) also stated that he was aware of DeLorean's financial troubles before he contacted him, and had heard him admit that he needed US$17 million "in a hurry" to prevent DMC's imminent insolvency. Taken together, these two elements allowed DeLorean to successfully defend himself at trial with the procedural defense of police entrapment. DeLorean's lawyers successfully argued that the FBI and DEA had unfairly targeted and illegally entrapped DeLorean when they allowed Hoffman (an active FBI informant who only knew DeLorean casually) to randomly solicit DeLorean into a criminal conspiracy simply because he was known to be financially vulnerable. Another factor was DeLorean's lack of criminal history, whereas Hoffman was a career criminal who stood to directly benefit if he was able to convince DeLorean to incriminate himself on tape. The DeLorean defense team did not call any witnesses. DeLorean was found not guilty on August 16, 1984, but by then DMC had already collapsed into bankruptcy and DeLorean's reputation as a businessman was irrevocably tarnished. When asked after his acquittal if he planned to resume his career in the auto industry, DeLorean bitterly quipped, "Would you buy a used car from me?" On November 1, 1994, DeLorean filed U.S. Patent 5,359,941 with the US Patent and Trademark Office for a raised monorail transport. The transport was never built. In the years before his death, DeLorean planned to resurrect his car company, and gave interviews describing a new vehicle called the DMC2. According to his family, he spent a lot of time in his last years working on this new venture. In an effort to gather funds, he designed and sold high-end watches via the internet under the name DeLorean Time. The DeLorean Motor Company name was subsequently owned by a Texas-based firm that provided parts and professional restoration to DeLorean owners. Although John DeLorean was not involved in the business, its vice president James Epsey spoke with him on the phone once a month. According to Epsey, in their final conversation, DeLorean expressed his dismay at the direction of General Motors, saying "They have too many bean counters and not enough engineers." DeLorean was married four times. His first marriage to Elizabeth Higgins on September 3, 1954 ended in divorce in 1969. DeLorean then married Kelly Harmon, the sister of actor Mark Harmon and daughter of Heisman Trophy winner Tom Harmon and actress Elyse Knox on May 31, 1969; they divorced in 1972. While single, DeLorean adopted a son he named Zachary Tavio, 14 months old at the time of his third marriage to model Cristina Ferrare, who co-adopted Zachary. Together they had daughter Kathryn Ann, born November 15, 1977. They divorced in 1985. He then was married to Sally Baldwin until his death in 2005. They lived in Bedminster, New Jersey. DeLorean's name is correctly spelled without the space, as DeLorean; the same goes for the Company. DeLorean appeared in a widely published magazine advertisement for Cutty Sark whisky in the year prior to his arrest and the collapse of his company. It was captioned "One out of every 100 new businesses succeeds. Here's to those who take the odds." When the film Back to the Future released in 1985, featuring DeLorean's namesake car, DeLorean wrote a letter to Bob Gale, one of the movie's producers and writers, thanking him for immortalizing the car in the film, as indicated in the special features of the Back to the Future DVD release. In 1999, DeLorean declared personal bankruptcy after having fought around 40 legal cases since the collapse of DeLorean Motor Company. He was forced to sell his 434-acre (176 ha) estate in Bedminster, New Jersey, in 2000. It was purchased by real estate tycoon Donald Trump and converted to a golf course. DeLorean died at Overlook Hospital in Summit, New Jersey from a stroke, on March 19, 2005 at the age of 80. His ashes are interred at the White Chapel Cemetery, in Troy, Michigan. His tombstone shows a depiction of his DeLorean sports car with the gull-wing doors open. Driven (2018), Actor Lee Pace portrays John DeLorean in a film about the FBI sting operation to entrap the maverick car designer. DeLorean (1981), A documentary directed by Academy Award winning filmmakers D. A. Pennebaker and Chris Hegedus. The film chronicles John DeLorean throughout the launch of his DeLorean sports car in 1981. DeLorean: Living the Dream (2014), Chronicles the history of the iconic DeLorean automobile from the rise and fall of legendary automaker John Z. DeLorean, to the international phenomenon of loyal owners and devoted fans who've kept the dream alive for over three decades. Framing John DeLorean (2019), Actor Alec Baldwin will portray John DeLorean in scripted scenes featured throughout the documentary. Monkeys (1989), A BBC Northern Ireland TV movie based on the book The DeLorean Tapes. It was directed by Academy Award winning director Danny Boyle, and stars Manning Redwood as John DeLorean. Car Crash: The DeLorean Story (2004), a BBC television documentary about the rise and fall of the DeLorean Motor Company. Anything To Win: The Crash of John DeLorean (2006), a TV series produced on Game Show Network. Untitled DeLorean Miniseries, A miniseries based on the life and career of John DeLorean, and the rise and fall of the DeLorean Motor Company is in active development from Stainless Steel Productions. "Stainless Style" (2007) A concept album about DeLorean by the synthpop group Neon Neon. The DeLorean Museum, based in Humble, Texas, was established in 2006, to honor John Z. DeLorean through the display, interpretation, conservation, and preservation of DeLorean vehicles, archives, and other objects. ^ Claire Suddath (April 19, 2012). "The DeLorean's Time Leap". Bloomberg Businessweek. ^ a b c "John Z. DeLorean, Father of Glamour Car, Dies at 80". The New York Times. March 21, 2005. Retrieved May 6, 2010. ^ a b Warren, Tamara (October 21, 2011). "My John DeLorean Story". Forbes. Archived from the original on October 22, 2011. Retrieved April 10, 2012. ^ "John DeLorean". delorean-dmc-12.com. Retrieved April 10, 2019. ^ a b Reed, Christopher (March 21, 2005). "Obituary: John DeLorean". The Guardian. Retrieved June 23, 2009. ^ Oagana, Alex. "John Zachary Delorean – the Detroit Dream Merchant". Auto Evolution. ^ a b c d "John DeLorean". Telegraph. March 22, 2005. Retrieved April 1, 2016. ^ a b c d Bernsteinl, Adam (March 21, 2005). "Flashy Automaker John Z. DeLorean, 80, Dies". The Washington Post. p. 2. Retrieved April 1, 2016. ^ a b c d e f Hakim, Danny (March 21, 2005). "John Z. DeLorean, Father of Glamour Car, Dies at 80". The New York Times. Retrieved 2016-04-01. ^ Bernsteinl, Adam (March 21, 2005). "Flashy Automaker John Z. DeLorean, 80, Dies". The Washington Post. p. 1. Retrieved April 1, 2016. ^ Lapham, Edward (October 31, 2011). "DeLorean didn't fit the GM mold". Automotive News. Retrieved 4 March 2016. ^ Cummings, Judith (October 20, 1982). "DeLorean, automobile executive, arrested in drug smuggling case". The New York Times. Retrieved March 24, 2016. ^ "1984: DeLorean cleared of drugs charges". BBC News. BBC. 1984-08-16. Retrieved 2016-11-25. ^ "1984 Year in Review: John DeLorean Trial". UPI. October 29, 1982. Archived from the original on July 22, 2013. Retrieved October 15, 2010 – via upi.com. ^ "USPTO Record". Patft.uspto.gov. Retrieved October 15, 2010. ^ Mateja, Jim (October 13, 2000). "DeLorean marks time before staging comeback". Chicago Tribune. ^ "Flashy Automaker John Z. DeLorean, 80, Dies". The Washington Post. March 21, 2005. Retrieved January 6, 2011. ^ "DeLorean Collectibles:Cutty Sark ad". Babbtechnology.com. April 8, 2008. Retrieved October 15, 2010. ^ Sanderson, Bill (March 25, 2000). "DeLorean is driven off N.J. estate". The New York Post. Retrieved 2016-04-01. ^ Profile, findagrave.com; accessed January 6, 2016. ^ "Home Page". The DeLorean Museum. Retrieved October 21, 2015.